Correct Wheel Sizes, PCD, Offset, Rims and Tire specs for Mahindra TUV300 series. 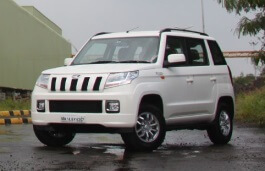 I want to upsize the tyres of tuv300 T8 variant to a 16 inches rim. What would be the best configuration to go for it without compromising on fuel efficiency and wear and tear of other parts? can we increase the tuv 300 vechile wheel base from std 15 inch to 17 inch big broader wheel to give a rough look..?? I want to do it too but the space provided by mahindra to upsize to r16 wheel is very less, very less probability.